ConAgra Foods’ smorgasbord is ready to carve. The Hunt’s-to-Swiss Miss conglomerate’s $6.8 billion acquisition of Ralcorp in 2013 has left a bad taste for shareholders. Pushy investor Jana Partners is ready to shake up the board. ConAgra’s myriad brands probably fit better elsewhere. The question is how to slice it. The $17 billion packaged-food group’s shares jumped 10 percent after Barry Rosenstein’s hedge fund on Thursday disclosed a 7.2 percent stake and that it was prepared to nominate three new directors. Jana hasn’t said what more should be done but reckons ConAgra has inadequately addressed the failure of its deal for the maker of white-label goods. The company wrote down the value of its private-label business by $1.3 billion in March, the third time it has taken a charge on the division since buying Ralcorp. Chief Executive Gary Rodkin stepped down in April, a month ahead of his planned retirement. His replacement, Sean Connolly, has yet to announce his plans. The former boss of Hillshire Brands obviously isn’t deal-averse, however. He attracted a bidding war for the purveyor of Ball Park frankfurters and Jimmy Dean sausages, and eventually sold it to Tyson Foods last year for $7.7 billion. There may be some appetite for ConAgra’s various morsels. Analysts at Credit Suisse, for one, estimate that the various parts – including branded and frozen foods, private-label goods and another division that sells French fries to fast-food chains – could be worth $42 to $43 a share in a full breakup. The rise in ConAgra’s shares on Friday put them right in that zone. Pulling apart all the various pieces could be complicated, however. TreeHouse Foods, for one, has said it is on the hunt for acquisitions. The rival private-label company only has a market value of $3 billion, however, which suggests that it might require some financial contortions – perhaps a reverse Morris Trust – to make a deal work with ConAgra. It also might be hard to wring additional value from offloading frozen foods and taters to the likes of Pinnacle Foods, or even Tyson. Even so, there may be many ways to chop ConAgra. With Jana now involved, there will be pressure to put all options on the table. 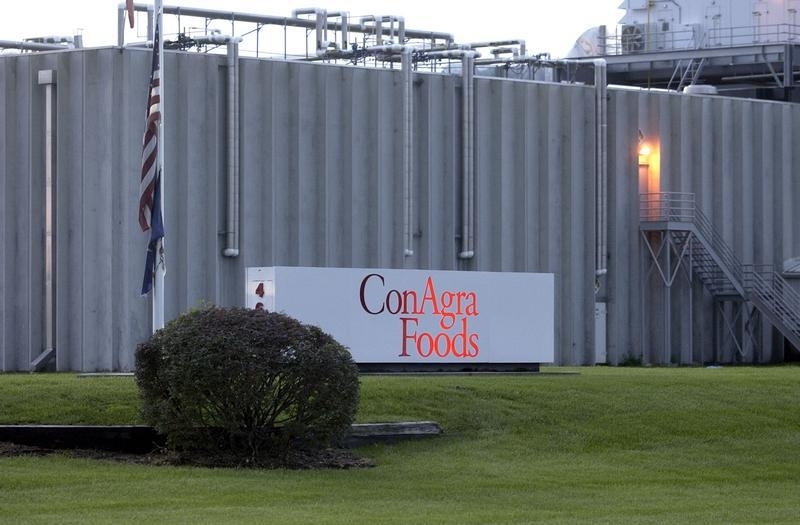 Hedge fund Jana Partners has acquired a 7.2 percent stake in ConAgra Foods and said it was prepared to nominate directors to the company’s board, according to documents submitted to securities regulators on June 18. Since its $5 billion acquisition of private-label food maker Ralcorp in 2013, ConAgra has missed forecasts, cut long-term targets, failed to increase its dividend and faced operating challenges, Jana said. Its three potential board nominees would be Jana founder Barry Rosenstein, former Nestlé USA Chief Executive Brad Alford and Diane Dietz, who used to oversee supermarket chain Safeway’s private-label business. ConAgra’s shares rose more than 9 percent in afternoon trading on June 19.